It’s the most wonderful time of the year at Fremont Brewing Company. After a successful Bourbon Barrel Aged Dark Star release on October 1st and their launch in Oregon State just 2 days ago, Fremont is ready to release their 2015 Vintage Bourbon Barrel Aged Abominable Ale – more commonly known as B-Bomb. This rich, intense, caramelly, fruity, bourbony, vanilla-ish stout is one of my annual favorites and, now that I think about it, one of my very favorite bourbon barrel aged beers period. In fact, my own personal craft cellar has a rather high preponderance of B-Bomb (and Darkstar) bottles in different varieties. Last year’s Coffee Cinnamon B-Bomb variant was one of my absolute favorites. I covet the few bottles I have left and save them for special occasions. It may still be Fall, but it sure feels like Winter out there. We’ve already had a few good storms this season, and today is looking pretty stormy as well. At least, however, there’s one positive side to having the cold and wet weather return: Winter Ales. When the wind and cold returns, most palates crave something a bit thicker, a bit darker, perhaps even a bit spicier. Pike Brewing Company is answering your taste buds’ call with the return of their annual Winter Ale: Pike Auld Acquaintance. Fremont Brewing Company is extremely popular and it’s pretty easy to see why. Their impressive lineup of beers keeps Seattle craft lovers satisfied year round. From their hoppy and thirst-quenching Interurban IPA to their easy drinking Summer Ale and their sought after offerings like Darkstar and Abominable, they honestly don’t make a single beer I don’t like. People from our craft sister city, Portland, also love Fremont Brewing Company beers but, until now, they’ve had to make a special trip up here to get them. Not anymore. Starting today, November 17th, Fremont Brewing Company beers, in a partnership with Columbia Distributing, are now available in Oregon State. This coming Saturday, November 14th, is the 28th Annual PNA (Phinney Neighborhood Association) Winter Beer Taste – Aka: Beer Wars: The Wort Awakens. That’s right. This event has been going strong for 28 years now. Amazing. This popular annual event will give you 10 tastes from a selection of 30 NW breweries, pub style snacks and a silent auction of awesome beer stuff. Back in September, I told you about the 2015 Winter Beer Festival. Now, as the festival draws closer, the Washington Brewer’s Guild has announced the full beer lineup for this popular annual festival. Winter Warmers, Barleywines, Spiced Ales and more; they’re all here and ready to warm you up on those cold Winter days ahead. Get your tickets now before they sell out. Seattle has no shortage of great craft beer bars and some of my favorites, such as Beveridge Place Pub and The Beer Junction, are in West Seattle. Incredibly, however, the demand for craft beer and for great places to drink it continues to grow, so there’s always room for more. Enter Ounces. With a focus not only on what you drink but the environment in which you drink it, Ounces is looking to set themselves apart by offering a unique space with ample, year-round outdoor seating (rain or shine), being family friendly (open to all ages), pet friendly and more. It seems like only yesterday that Two Beers Brewing Company (CBM Sponsor) opened their latest iteration of The Woods, the shared taproom for Two Beers Brewing and Seattle Cider Company. Now, only 5 months later, Two Beers has more exciting news. Coming up on Saturday, November 14th, Two Beers Brewing Company will celebrate their 8th Anniversary. Also, on that same day, Two Beers Brewing is excited to announce their partnership with Bread & Circuses is ready to commence. The in-house kitchen that Two Beers has been working on since The Woods 3.0 launched back in June is ready to open as Bread & Circuses’ first ‘brick and mortar’ location. I haven’t always been a fan of sour beers. When I first heard about them, several years ago, the very idea seemed rather odd to me. Why would you want a beer that’s sour, I thought? Well, that all changed for me about 6 years ago when I decided to attend the annual Sour Fest at Brouwer’s Cafe. I tried several different sours and became an instant convert. 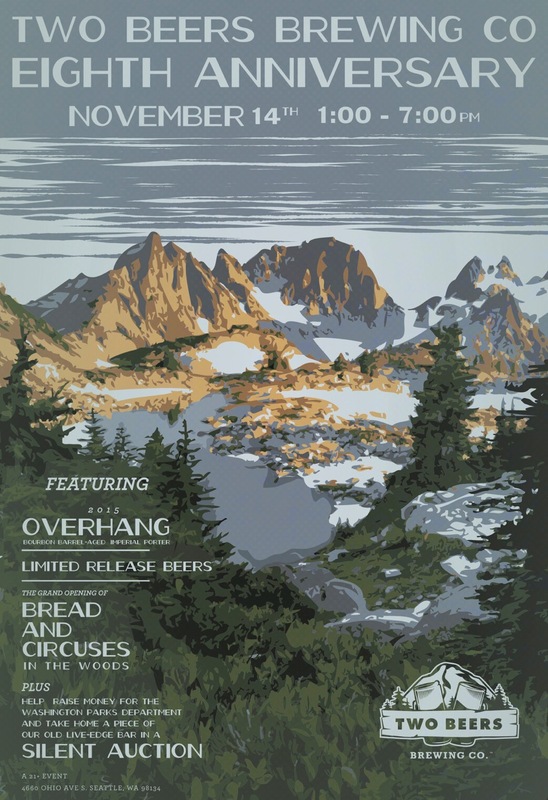 In the intervening years, Sour Fest has grown to become one of the most popular events each year during Seattle Beer Week, and I look forward to each new sour beer release in the Seattle area (as do many others). 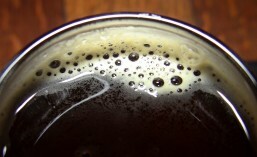 Now, Black Raven Brewing Company (CBM Sponsor) has given me another reason to get excited. They are bringing back their Corvus Frambicus Sour Ale.